Your residential search resulted in 9 properties found. Being just one of 3 substantial properties, this exceptionally LARGER THAN AVERAGE 4 BED END OFF TERRACED VILLA STYLE PROPERTY ON 4 LEVELS enjoys superb panoramic views to the rear over farmland to Blackstone Edge in the distance, Syke Common to the front and with the benefit of an enclosed garden. Dating back to 1863 and having undergone an extensive renovation programme, the property is essentially a new house internally. With spacious accommodation over 4 levels, there are 3 reception rooms, study, large kitchen, utility room, ground floor WC, 4 bedrooms and 2 bath/shower rooms. Viewing is absolutely essential to fully appreciate this outstanding property, the immediate location and views. Conveniently located within easy reach of local amenities including schools and on the edge of beautiful countryside. The accommodation comprises, on the GROUND FLOOR: ENTRANCE HALL with staircase to first floor; SITTING ROOM with view over Common to front; LOUNGE with views to rear, staircase to lower level and opening to STUDY with window to side and door to WC with washbasin. On the LOWER GROUND FLOOR LEVEL there is a large DINING ROOM with window to side and fitted cupboards; BREAKFAST-KITCHEN with good range of white High Gloss fitted units, integral electric oven, 5-ring gas hob and walk-in cupboard under the stairs; UTILITY ROOM with space for several appliances and glazed door to back garden. On the FIRST FLOOR, BEDROOM 1 enjoys an exceptional panoramic view to the rear; BEDROOM 2 overlooks the Common and the BATHROOM comprises a bath with plumbed shower above, WC, washbasin and chrome ladder towel radiator. The SECOND FLOOR has a 3rd double BEDROOM with views to the rear; BEDROOM 4 which is a good sized room with skylight and partially restricted headroom; SHOWER ROOM comprising shower with electric shower, WC, washbasin and white ladder towel radiator. EXTERNALLY, there are steps and railings to the front and an enclosed lawned garden to the rear. The property was originally built in 1863 and is understood to be freehold; Gas central heating (combi-condensing boiler); uPVC double glazing; All certificates available for the work carried out; Council Tax Band yet to be assessed by the Council. Sound test certificate available - well exceeds minimum requirements. A MODERN 3 bedroom SEMI DETACHED property which has been EXTENDED TO THE GROUND FLOOR and offers a 4th bedroom/additional sitting room and which is situated in a SMALL CUL-DE-SAC with gardens and off road parking. Situated close to the popular Fairway development in Castleton; village shops and amenities are only a short walk away including Castleton train station providing direct links to Manchester city centre. There are primary schools and parks close by as well as Castle Hawk golf club & driving range, Castleton Gabriels football club and Mayfield rugby club. The ACCOMMODATION COMPRISES an ENTRANCE PORCH leading to the LOUNGE with staircase leading to the first floor. The BREAKFAST KITCHEN to the rear has a comprehensive range of fitted wall and base unit's including a breakfast island. 4 ring gas hob with extractor fan over and built under electric oven, plumbing for automatic washer and dishwasher, part tiled walls. CONSERVATORY with laminate floor covering. BEDROOM/SITTING ROOM with W.C and wash hand basin. To the FIRST FLOOR the LANDING offers access to 3 BEDROOMS along with a BATHROOM/W.C COMBINED with 3 piece suite, shower over bath and shower screen, fully tiled walls, tiled floor. OUTSIDE the property has a rockery garden to the front with a driveway providing off road car parking. To the rear there is a timber decked patio area. Beyond this there is additional garden which is acquired by the current owner under an informal agreement with a land owner. Buyers should seek their own lease terms with the land owner if they wish to continue to make use of the garden. Rent is expected to be in the region of ?100 per annum. We understand that the property is LEASEHOLD and is subject to a ground rent of ?14.00 per annum (to be confirmed) GAS CENTRAL HEATING. DOUBLE GLAZED WINDOWS WITHIN UPVC FRAMES. Council Tax Band; 'C'. EPC RATING 'TBC'. Situated in a popular area within a short walk of Whittaker Moss primary school, an extremely well presented 3 bedroom dormer style semi-detached house. The property has the benefit of modern fittings throughout, an attached brick built garage and views to distant farmland. Both Norden village and Bamford village are within walking distance as are buses to Bury, Manchester etc. The property comprises: entrance VESTIBULE with meter cupboard; spacious LOUNGE with cupboard below staircase; DINING-KITCHEN with modern High Gloss fitted units, integral electric oven, ceramic hob, extractor hood and dishwasher, stable door to patio and pantry; 2 DOUBLE BEDROOMS & 1 SINGLE BEDROOM with cupboard above bulkhead; BATHROOM with modern white suite comprising bath with plumbed shower above, WC, washbasin, fully tiled walls and chrome ladder towel rail. There is an attached brick built garage. There are gardens to front and rear. 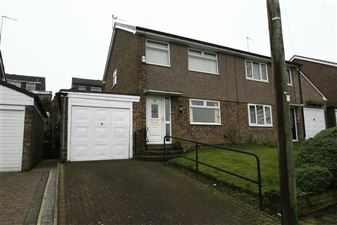 Built in the early 1970's; Tenure is freehold; Council Tax Band C; Gas central heating. Situated at the head of a small cul-de-sac adjacent to open recreational land (fenced-off), an extremely well presented and larger than average 3 bed modern semi-detached house. With the benefit of 2 parking spaces (potential to create more) and good sized gardens with open aspects, viewing is essential to fully appreciate this delightful property, plot and immediate location. Conveniently placed within easy walking distance of primary schools and secondary school, shops and beautiful countryside. The accommodation comprises: PORCH with space for hanging coats etc; CLOAKROOM comprising WC and washbasin; spacious LOUNGE with wood effect flooring, Hammonds fitted cupboards below spindled staircase and private aspect to front; good sized DINING-KITCHEN with opening from lounge comprising attractive modern High Gloss cream coloured units with integral electric oven, microwave, induction hob, extractor hood, fridge, freezer, washing machine and dryer plus French double doors to decking and wood effect flooring. To the FIRST FLOOR the landing has a trap door to the loft and a built-in cupboard above the bulkhead; BEDROOM 1 with open aspect to front; BEDROOM 2 with open aspect to rear; BEDROOM 3 to front; BATHROOM with modern suite comprising a shaped shower-bath with folding shower screen and plumbed shower above, WC, washbasin, chrome ladder towel rail and fully tiled walls and Karndean flooring. EXTERNALLY, the gardens extend to front, side and rear with a good sized decking area and drive for 2 cars. Built in 1999, the property is understood to be long leasehold subject to a ground rent of ?75 per annum; Council Tax Band B; Gas central heating; uPVC double glazed; Cavity wall insulation.